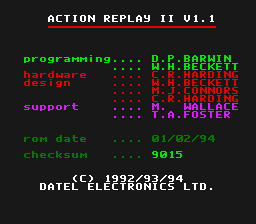 The second version of the SNES Action Replay, now with a slow-motion feature and improved code support (including the ability to patch ROM addresses). Other than copyright text, are there any differences between the two known revisions? As with the previous version, hold R while starting or resetting the Action Replay menu to display a credits/information screen. This screen contains the program version, copyrights, build date, and checksum. This page was last modified on 25 August 2016, at 12:53.